The Atlantean Conspiracy: Conspiracy Theorist or Conspiracy Realist? Conspiracy Theorist or Conspiracy Realist? 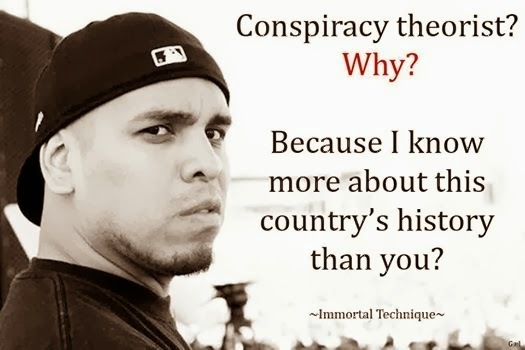 Conspiracies exist. They happen. They've been documented. There's laws against them. Thousands have been convicted and jailed for them. Yet for some reason the mainstream majority marginalizes the idea of conspiracies ever taking place. With conspiracy bobble-heads figure-heads like Alex Jones screaming daily paranoia and misinfo over the airwaves or David Icke always going on about shape-shifting reptilian-human alien hybrid overlords, it's no wonder the general public scoffs at so-called "conspiracy theorists." But what if the reality of the controlled world we're living in truly is conspiratorial? What if the truth really is a conspiracy? 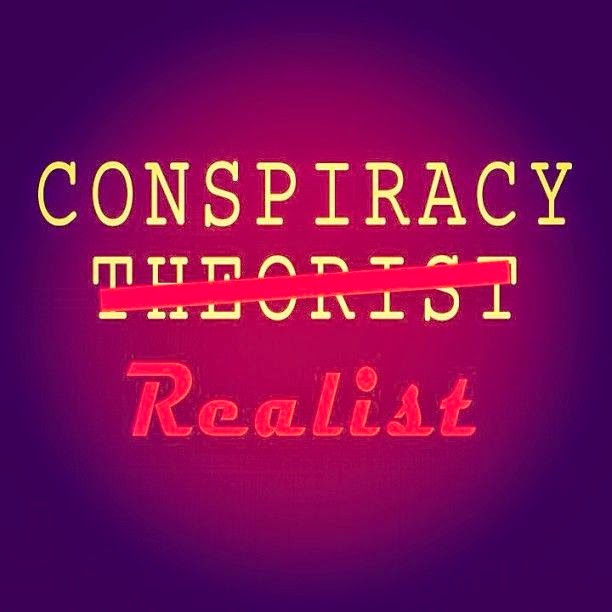 Then researching and expressing this fact makes you a "conspiracy realist," not a "conspiracy theorist." And if you deny this fact, it doesn't make you a "rational moderate" as most pretend, it just makes you a closed-minded, gullible, malleable, herdable, parrot in denial. The fact is that conspiracy is the rule, not the exception. Every American President in history has come from ancient British and/or French royal bloodlines. 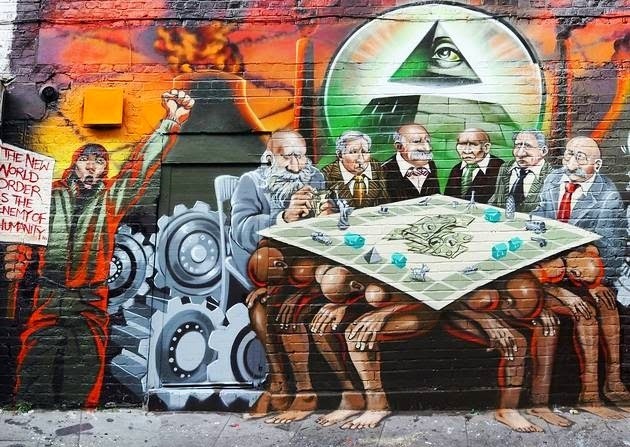 Secret Societies like the Freemasons, Skull and Bones, Bohemian Grove, the CFR, Bilderberg Group and Trilateral Commission all exist and maintain incredible power and influence over world politics, media, military, and economics. The world-wide mainstream media is controlled by a small handful of secret society members. The world-wide forced government indoctrination system brainwashing our children was given to us by the same people. So was the criminal banking system controlling the world economically. Read about Operation Northwoods, the Lusitania false-flag, the Pearl Harbor false-flag, the Gulf of Tonkin false-flag, 9/11, and other proven conspiracies which have led to massive wars. Read about the inordinate amount of control Zionism and Zionists have over America and the world. Read about the long-planned New World Order One World Government slowly being brought to fruition by these people. Sure conspiracy "theories" abound on the internet, stories of various cryptozoological encounters or promises of Galactic Federations of benevolent ETs. These fringe ideas, many without a single shred of practical evidence, are indeed mere theories, with little to no reality behind them. However, the fact that humanity has long been controlled by a group of obsessively interbreeding "royal" psychopaths with secret society foot-soldiers who influence the masses through control of media, education, economy and politics, and who are voraciously working towards ultimate centralized power in a New World Order is not a theory. It is the conspiratorial reality we're living in and it's getting far too late in the game of good vs. evil to remain passively protected by denial with heads in the sand. It's high-time people side-step the group-think, research the true history of humanity, and become proud conspiracy realists. Labels: Activism, Controlled Opposition, Misc. How about some prima-facie evidence of intent to cover up institutionalised pedophilia in the UK? "Michelle Obama, First Lady of the United States, was born Michael LaVaughn Robinson in Chicago, Illinois on January 17th, 1964. He was the second son born to Fraser Robinson III, a well known cocaine dealer and union thug for Crime Lord/Mayor Richard J. Daley, and Marian Shields Robinson, a transient street prostitute who was diagnosed with the HIV virus in 1998." One of your best articles, Eric! Stupidity and ignorance seem to be human rights, everybody has its own path of learning the teachings of life. One thing worth our consideration is our rhetorical strategy: too many conspiracy theorists have only a hammer and thus approach everyone as if they are a nail. The person who is no longer under illusion can, like an empty bowl, receive. But the person who is under an illusion must first be released from the illusion. In their case the bowl is already full and anything you attempt to pour in will merely spill over. The phrase "under illusion" is worth noting, for the metaphor points to an important truth. When communicating with someone under an illusion do not imagine that you are talking to a single self. The person under the illusion has two selfs: the illusion believing self and underneath a suppressed self seeking emancipation. The rhetorical task therefore is not to destroy the illusion believing self, but o help the suppressed self free itself. Attacked by a hammer the illusion believing self will recoil and take a defensive posture that will prevent you from reaching through to the suppressed self. Instead, welcome the illusion believing self and encourage it to expose itself. It will expose itself for what it is, an illusion believing self. When the illusion believing self has revealed itself sufficiently the suppressed self will be able to free itself. I hope that wasn't confusing. In simple terms what I'm suggesting is that it is the official stories themselves, the illusions, that provide the most convincing evidence that they are illusions. And secondly, that we must respect the suppressed self in the individuals we communicate with, just as one who wishes to free a slave must first have a deep human respect for the slave no matter how pitiful their condition. Excellent points and strategy Nonoun, thanks! Can you elaborate on how you would use your strategy in practice? Thx. The strategy is based on the notion that we cannot persuade someone into reality, but rather it is they that persuade their self out of illusion. The method is Socratic in nature, so Plato’s Theaetetus dialogue is a good work to investigate if you are interested in this approach. A more contemporary maieutic philosopher is Soren Kiergaard. “The Point of View” and “On My Work as an Author” are two works in which he discusses the maieutic nature of his authorial output. If you would like to listen to the maieutic approach being well executed I recommend listening to Henrik Palmgren interviewing transhuman apologist Zoltan Istvan on his Red Ice Creations radio show, “The Transhumanist Wager: In Favor of Eugenics & Technological Dictatorship.” Palmgren encourages Istvan to express and explore the horror of his philosophy. it's expertly done. A few things I would like to bring to your attention about this method. Firstly, Socrates likened his approach to being a midwife: helping the suppressed self free itself is analogous to a midwife helping at a birth. Part of the skill then, is in diagnosing when a person is “pregnant,” and the potential for emancipation is ripe. Secondly, the more identified a person is to their illusion the more difficult and challenging their emancipation journey will be. Don’t expect immediate positive responses. Indeed, most of the person’s emancipatory work will take place alone, when they have time to think in a non-threatening space. It truly is a process in which they free their self. Finally, we are all under illusions to some extent and so this is not just something you do to others but rather a skill you develop by applying it to yourself. Always bear in mind that you might be under the illusion that the other is under an illusion when in fact it is the other way around. whether they are emancipated or you are, both are good outcomes. Thanks Nonoun. This is something very valuable I need to learn. My people skills aren't great. I'll have to think about it. Perhaps I'm always in a rush to get the point across... Hmmm. Nonoun, thank you for the critical expression of the maieutic perspective. I have been following Eric for 5 or 6 years, and often I think his approach generally lends to shattering the illusion, rather than assisting people to free themselves. I've brought this point to him before in a slightly different way when discussing his facebook photo-memes and adverts - which are alarmist in nature. The initial shock can dissuade the audience before they're given a chance for persuasion or self realization. Are the six players at Monopoly generic, or are they identifiable? Heliumdream, Erick and I also have fights — really, how can he be aware of so much and yet still be so wrong? But I do think he's open to criticism and alternative views, and at the end of the day, biting our tongue, we ought to respect his autonomy. I would say, and I really hate to defend him, but to be fair I think his primary readership are people who are already suspicious things aren't as they seem and are actively looking for information. If that's the case a direct approach can be desirable. The maieutic strategy is a tacticians ploy taken with people who assume they already know what’s true, but yet, and it’s a big but, they are openminded enough to risk examining their belief. On a slight tangent, maieutics isn't necessarily a cuddly art: Socrates meet an untimely end. Maieutics embraces a wide range of styles, and may in fact lead to grotesque violence, especially if your primary target isn't the interlocutor. For example, you may want to draw out the interlocutor's dark interior, not so much for his edification, especially if he’s an intransigent fellow, but for the benefit of an audience. Thus, a prosecuting lawyer might rile a polite defendant so that he drops his mask and reveals his hidden monster. The maieutic effect then is for the jury, duly noted by their dramatic gasp. Another annoying maieutics approach is to mirror or exaggerate the interlocutor's behavior so he might come to see himself, or see how he appears to others. Rather than question him, you might more than agree. Children an comedians sometimes take this stance.The interlocutor may not thank you for your efforts (you may need to be good at dodging a punch) but who knows what miracles of reflection may happen when he’s on his own. Back to Erick, I fully encourage you to keep him humble and offer as much criticism as he can bear. But at the end of the day, we can only ask him to write what and how he thinks is right. But yeah, every now and again he needs a bashing. We don’t want him turning into Alex Jones. Heliumdream, I'd love to know more about your rhetorical experience, it seems that you're a thoughtful and sensitive chap/ess. Seriously, i'd love to hear your thoughts, I still find the issue of engaging people thwart with difficulty. 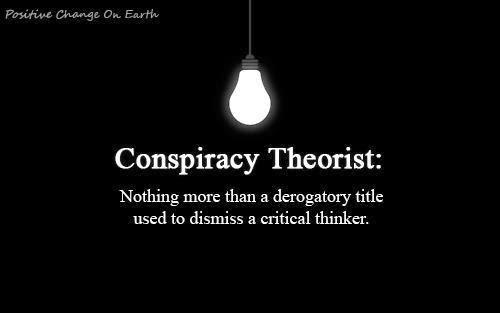 "Conspiracy Theorist: Nothing more than a derogatory title used to dismiss a critical thinker." Incorrect. It's a derogatory title used to dismiss someone who ignores most evidence due to a severe confirmation bias and fails to use Occam's Razor. What happened? You were in the middle or expressing an opinion, I'm dying to hear it. 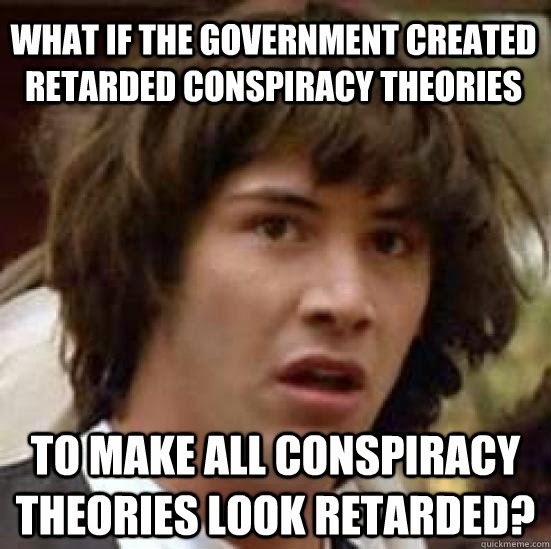 I tend to be a talker and find some people more receptive to 'conspiracy theories' than others. The obvious ones annoy me like chemtrails. It's a nice blue sky, planes fly back and forth criss-crossing the sky for several hours, then you have overcast skies, how can people not notice? Another obvious one is the use of symbolism in pop culture/mass media. There is just so much of it, it's no longer hidden like the 666 in walt Disney but the rockers think the satan hand sign means rock and kids think it means spiderman, except my boy, he knows. Anyway, I've changed tactics on the chemtrails and say geo-engineering and sight weathermodification.com as an actual business that does cloud seeding and similar, so yes people, planes spewing chems can change weather. As for those that fight it the most, the obvious in your face daily symbolism assault are usually those with the most education, ie, the most brainwashed and locked into the system. Perhaps I'm wrong but that is the way I see it. We are too programmed by that idiot box to think for ourselves. I see it in my wife, it's sad.